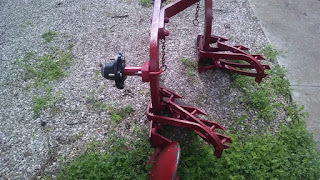 Our Newgren plow came without the landside wheel hub and the coulters and joiners. Most likely, the POs had found they didn’t want them when using the plow behind a tractor. 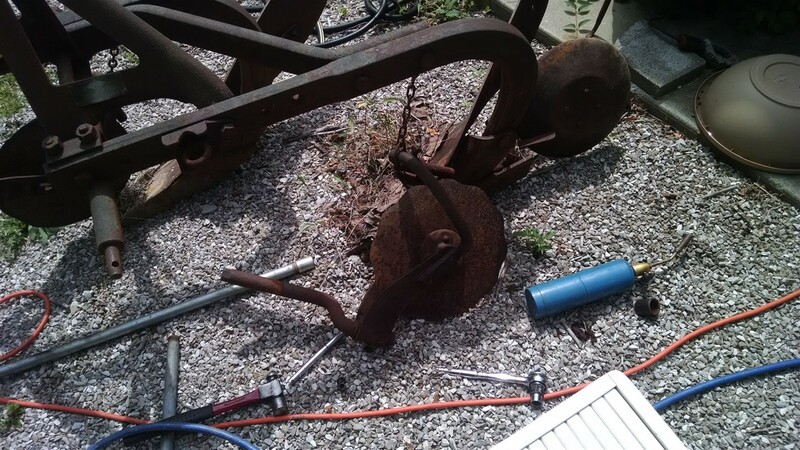 From research provided by our friend Clint, we knew that we could find the coulters and joiners on an old Dearborn or Ferguson plows, as Newgren used the same supplier for these parts. The wheel hub/spindle attachment was another matter. While we will continue to search, the odds of finding an original are small and we decided to fabricate a simple replacement. The plow uses the jeep’s spare tire mounted on the landside (opposite the furrow) of the plow as a depth control. 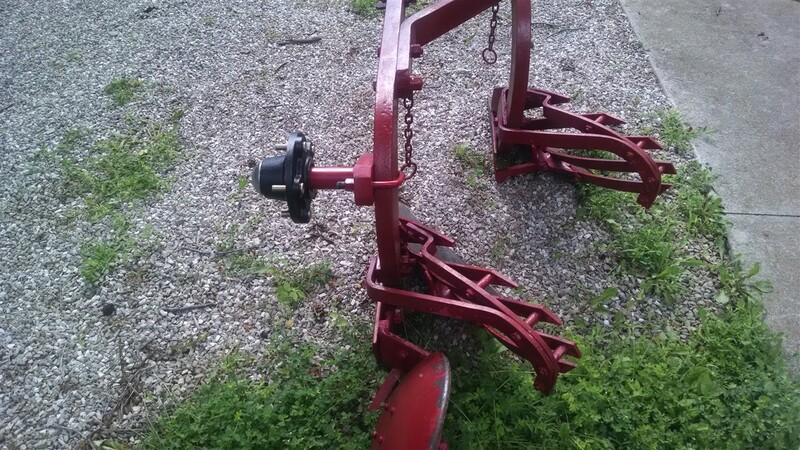 The adjustable bracket allows the operator to set and maintain the depth of the furrows. The landside wheel attachment is a simple affair: a hub matching those used on the jeep’s axles, a short spindle (axle) that holds the hub and a steel block with a “U” bolt for locking the assembly to the plow beam. 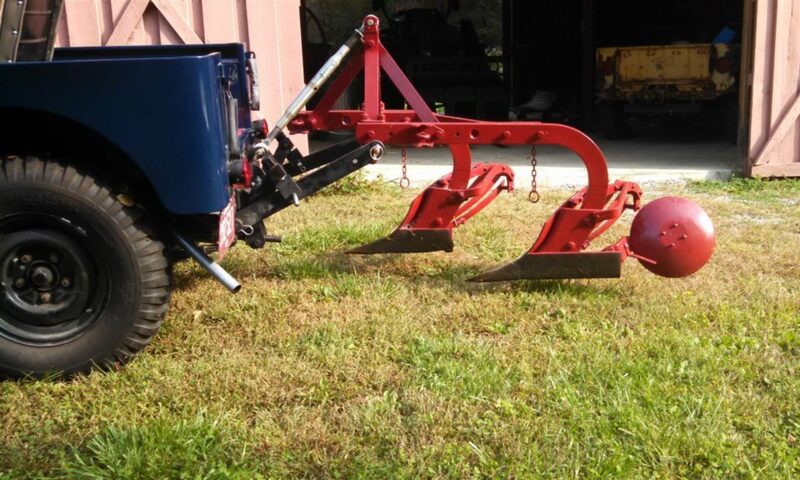 The original assembly, as shown in the above picture of Clint’s restored plow, is a nicely engineered and machined part. While not authentic, we chose to build something with off-the-shelf parts. Since our focus is on the jeep and not the plow, we think this is a reasonable compromise. Hubs and spindles used for building trailers are readily available online and at many farm supply stores. 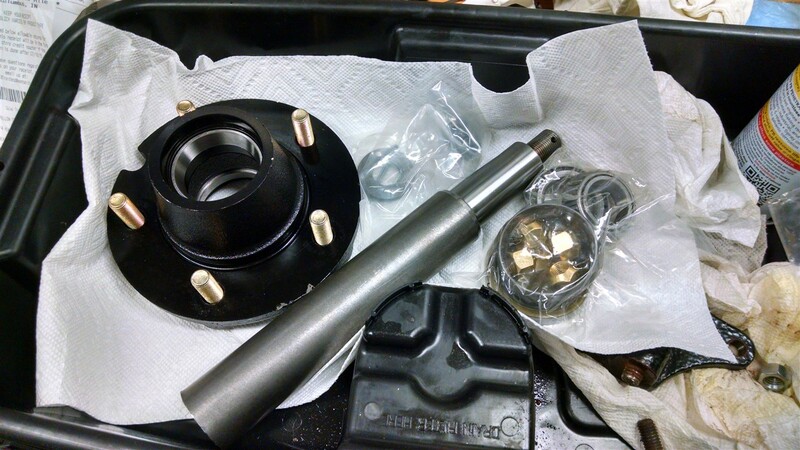 Finding a hub that matched the jeep’s 5 lugs on a 5 ½” pattern was a bit harder. Once again, we turned to our friends at TractorByNet.com for some help and we soon had a source for both the hub and spindle (Northern Tool). Clint was able to supply us with the critical dimension we needed to give to are welding/machine shop (6.25” from the face of the hub to the plow beam). The shop fabricated the “U” bolts and cut and welded the spindle to the steel block. Simple, but it works. When we took over the family farm 30 years ago, among the tractors and implements that came with the place was a Dearborn 2-14 plow. It hasn’t been used for several years and has been rusting quietly in the weeds behind the barn. Although he knew that the Dearborn would be the perfect donor for the coulters and joiners, Barry was reluctant to dismember the old plow that had been around the farm for 60 years. After spending months looking for the parts at used implement yards and farm sales, he determined that it was OK to borrow the parts of now. That decision was the easy part. With all that rust and our experiences with taking old jeeps apart, we pondered the need of a sit of welding/cutting/heating torches. 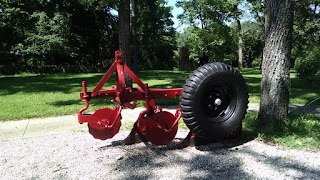 Barry posted another note on the TractorByNet fourm, asking for the tools needed for the disassembly, with the goal of as little damage as possible to the old plow. There were several good suggestions. And then there was the post by a member from Southern Alberta, Canada. “I use heat and a wax candle. The heat from a propane torch is fine but a Mapp torch is better. Oxy/acetylene or a tiger torch works well too. Just get the whole nut warm enough to melt the wax and use it as a penetrating oil. Wax seems to flow in better than anything as long as your using enough heat to keep the wax melted. Once you have the wax in there just take two hammers and hold one under the side of the nut and then hit the opposite side. You don’t need to hit hard you just want to set up a vibration between the nut and the bolt to help the wax penetrate. For the same reason it will help to hit the bolt on the head while it’s warm. Do this several times and you won’t even need a cheater pipe on your breaker bar. This was perfect, since we had a small propane torch and a ready supply of candles. Barry couldn’t wait to try this technique. He followed the simple instructions and with the help of a cheater bar had the first large nut moving. Using more wax and heat from the small torch, he quickly had the first coulter­/joiner assemble off without damaging any of the bolts. This has to be one of our favorite shop tricks. It did eliminate an excuse for buying a set of torches, but we will always have a few candle stubs in the tool box. Next steps are to clean and paint the rusty parts and add them to the plow. Update – The completed project is shown in the photo at the top!